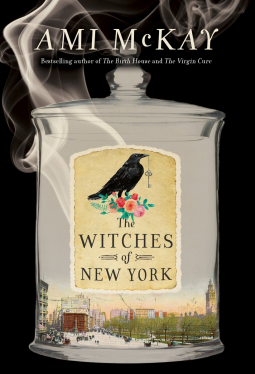 The Witches of New York is a novel about three mystical women who practice the art of witchcraft in a small teashop in the city of New York during Victorian period in the late 1800's. Between the three they offer seances, tarot card readings, midwifery, love spells, and herbal cures, as was popular during the era. There are also ghosts and magic sprinkled throughout. There is a strong magical element to this story, which may push historical fiction purists beyond their comfort zone. But if you can allow your imagination to believe, then I promise you will be charmed! Along with the white/good magic, there is also some darkness and evil in the form of a jealous husband and a religious zealot bent on making their lives miserable. The middle portion of the book was a little slow, but at the 2/3rd mark, the story definitely picks up. The author truly did a marvelous job at recreating the New York of the times with its culture, norms, and sights and sounds. Ami McKay is a lovely writer. Her heroines are always strong and assertive. The storyline is both dark and pleasant with a touch of mystery and paranormal. Definitely a charming, fun read!